Today's my birthday and while I should be posting a picture of a decadent layer cake, instead I'm sharing sweet potatoes and kale. And while some may think this is blasphemous, I would probably take a baked sweet potato smothered in goat cheese over a piece of frosted cake any day! Which is mostly because I'm not a huge cake person (though I will still make one this weekend! ), but also because this meal was so delicious! 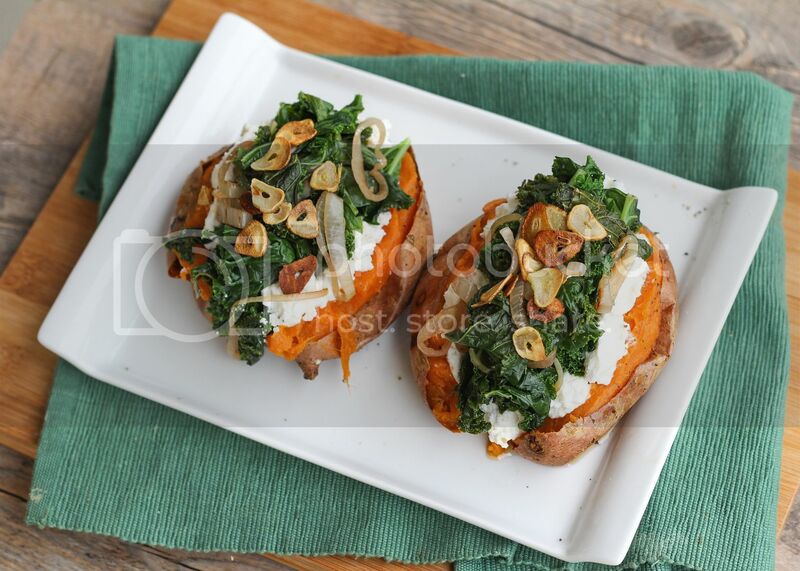 It's also simple to make - roast some sweet potatoes, top them with a mixture of light ricotta and goat cheese, some sauteed kale and shallots, and finally some crispy garlic chips on top. The original recipe only called for ricotta, but I added in some goat cheese because I find ricotta too plain on its own and because goat cheese goes well with sweet potatoes. It added more fat to the otherwise fairly light cheese mixture, but because there's not much fat elsewhere in the meal I thought it was perfectly acceptable! I also added shallots to the kale mixture for more flavour, but you can easily leave them out if you prefer. Just don't skip the garlic chips on top - they're so good and super easy to make! 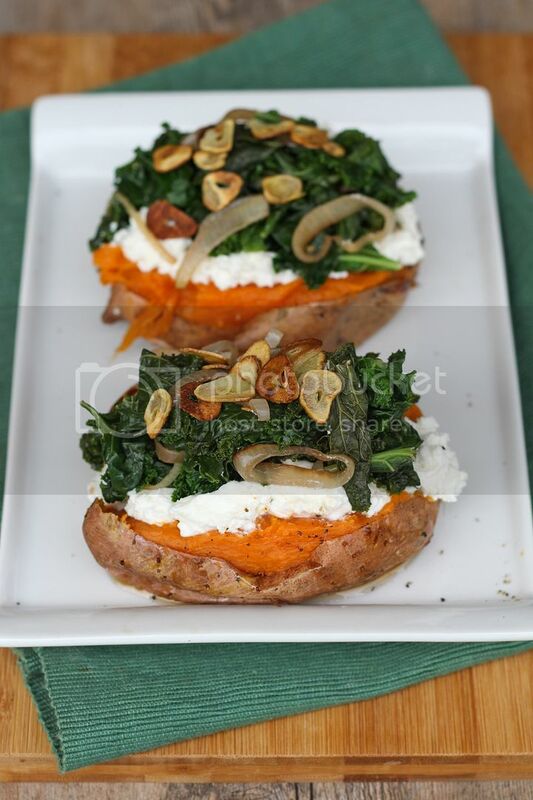 I loved how the sweetness of the potatoes was balanced out by the creamy cheese and slightly bitter kale, and because of the protein in the ricotta I considered this to be a complete meal in its own, and was actually pretty full afterwards! I'm thinking of making a cheesecake this weekend to celebrate my birthday with my family so if it turns out I'll be sure to share it soon to balance out the kale from today :) While I may not be a huge fan of regular cake, I always welcome a slice of cheesecake, probably because cheese makes everything better! Preheat oven to 450°F. Scrub sweet potatoes, pierce all over with a fork, and rub skins with 1 tablespoon olive oil (total for all sweet potatoes). 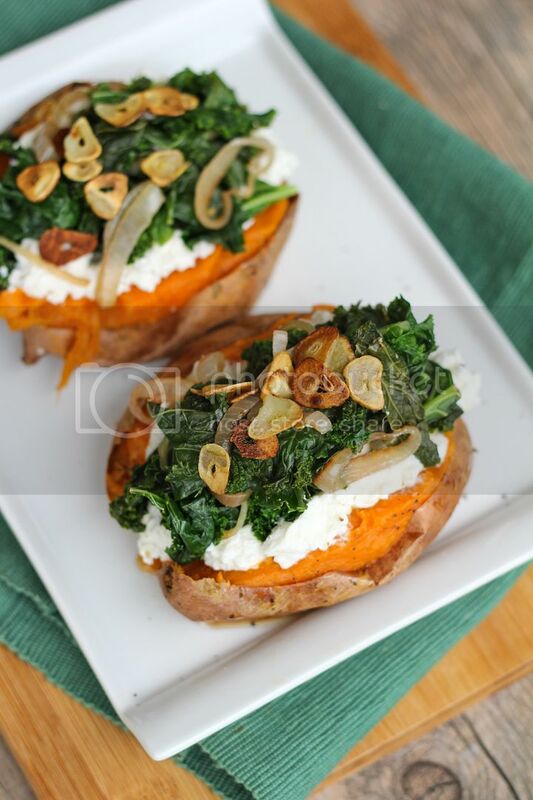 Place on a foil-lined baking sheet and bake in preheated oven until easily pierced with a knife, 45 minutes to 1 hour. Meanwhile, heat 1 tablespoon oil in a large skillet over medium-high heat. Add garlic and cook until golden, stirring often, about 1 to 2 minutes. Remove with a slotted spoon and set on a paper towel to drain. They should be crispy like garlic chips. Add shallot to the pan and sautee for a couple of minutes until softened. Add kale, cover with a lid, and let cook for 1-2 minutes. Remove lid, stir, and cook for another minute or two until just wilted and tender. Season generously with salt and pepper, stir in vinegar and red pepper flakes, and remove from heat. Mix goat cheese and ricotta in a small bowl until smooth. Season lightly with salt and pepper. 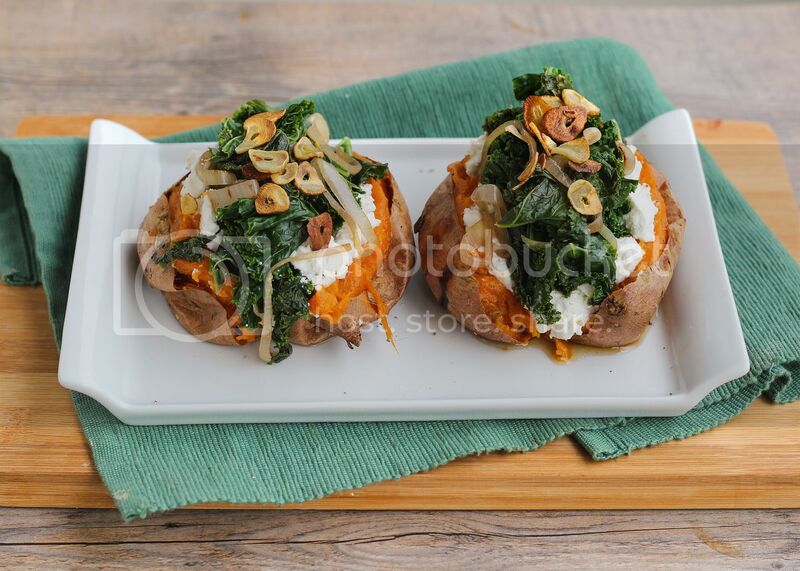 Cut each potato in half lengthwise, and top with the cheese mixture, kale mixture, and garlic chips (evenly divided across the 4 potatoes). Serve warm.